This light skin nutcracker is ready to greet your guests dressed in his finest. Imagine this exquisitely detailed nutcracker greeting your guests in your doorway or in your store front welcoming your customers this holiday season. Standing at attention, our regal, 6-foot tall nutcracker stands watch over the holiday season in classic elegance. He is accented with 23 LED lights, has a removable staff and is crafted in a traditional style. A holiday favorite for years Life Sized Nutcrackers have been a staple of residential and commercial Christmas decorating for generations. 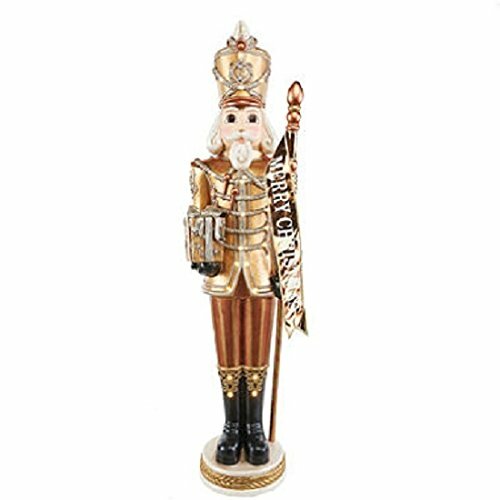 Infuse your home or business with a cheerful holiday spirit with this 6' tall resin nutcracker that will add liveliness and color. It is made of a durable resin material for year after year of holiday enjoyment.